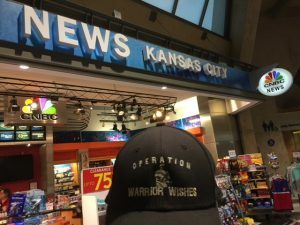 Since kicking off our 2018 “All32in17” mission to host and honor our nations warriors at all 32 NFL stadiums in 1 season, my dad has hosted warriors at 12 games across the country! This week he will be hosting Warriors in New England, Kansas City & New Orleans. After spending all day Wednesday watching the grandkids, he made his way to Boston on an overnight flight. 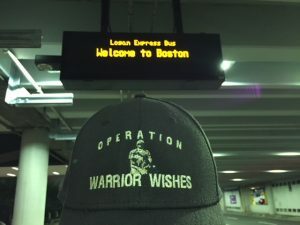 He arrived in “Beantown” at around 3am and grabbed a few hours of sleep at the airport before heading out to Foxboro to make Warrior Wishes come true. Today we had the honor of hosting Army Sgt Fritzgerald Jacquet, Army Sgt Xanthian James Luptak & Marine John Lozinski at the Patriots game. 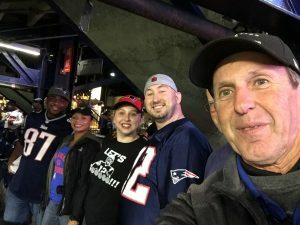 All 3 warriors were big Patriots fans & beyond excited for the opportunity to attend the game, especially Xanthin, as this was his first game ever! 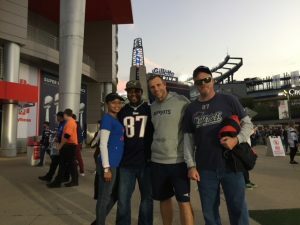 Army Sgt Xanthin ”James” Luptak did not even know he was going to the game up until 16 hours ago when his wife Jessica helped my dad set him up on a fake radio contest. After answering a few questions about the Patriots, my dad asked “What is the name of the stadium you will be going to tomorrow?.” My dad said his reaction was priceless! Army Sgt Fitzgerald Jacquet and Marine John Lozinski had both been to games before, but in John’s own words-“You made my day! !” – and he drove 5 hours to attend! John & “Fritz” were first to arrive at the stadium. 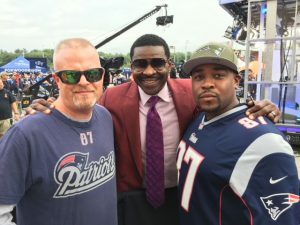 Their timing could not have been any better, as Michael Irvin was just arriving for Thursday Night Football telecast. He remembered what we did for the Boston Bomb survivors a few years back and spent a few minutes thanking the guys for their service! For the 7th straight season, our friend Clayton & the “Maine Lobster fishermen” hosted the warriors at their tailgate. As usual, the food & hospitality was amazing! 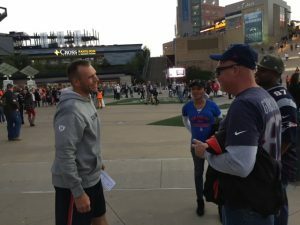 The Patriots defensive assistant, Brendan Daly once again helped us make wishes come true at the Patriots game. He has been a supporter of our mission since we started in 2012 when he was the assistant defensive line coach in Minnesota. 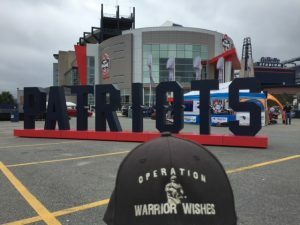 Brendan not only helps provide tickets to the sold out Patriots games, but he also always takes time to meet the warriors and personally thanks them for their service! Coach Daly, we cannot thank you enough! Unfortunately, Xanthin & his wife we’re running a little late due to some heavy traffic. 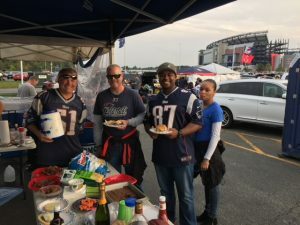 But thankfully they made it to the stadium in time to tailgate & have some fun before the group made their way inside Gillette stadium. 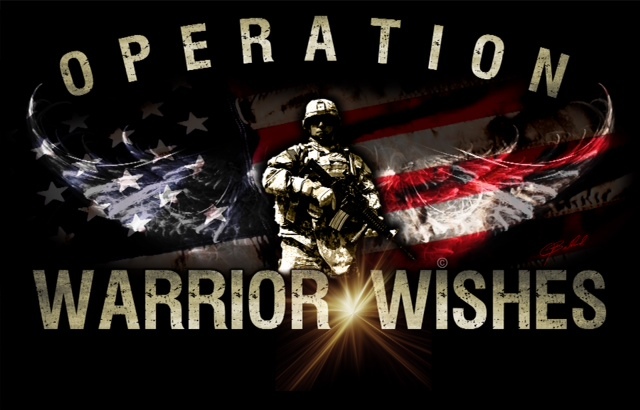 Brooke from Fox 13 even captured some of the fun during a live broadcast from The tailgate & featured the warriors & our mission. 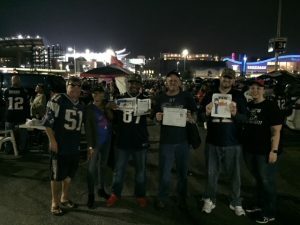 After filling up on all the steak & lobster at the tailgate, my dad presented the warriors with new Patriots caps courtesy of our friends at New Era & the group headed inside the stadium. 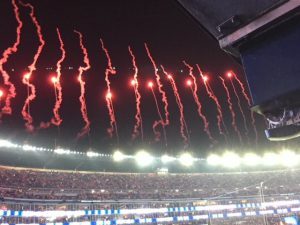 The Game was pretty much all Patriots as they dominated the Colts 38-24. The Patriots seemed to have rebounded from their slow 1-3 start,with last weeks “Must win” over the Dolphins and tonight’s victory to move into First Place in AFC East. Those types of comments never get old and keep us going! We couldn’t have provided such an amazing experience without the help of Coach Daly, Clayton & the lobster fishermen & New Era. Thank You! 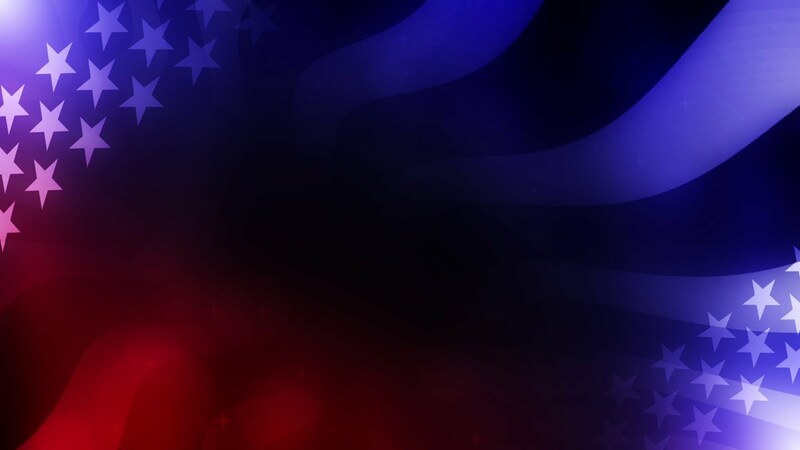 More importantly, we want to thank Marine John Lozinski, Army Sgt Fitzgerald Jacquet and Army Sgt Xanthin “James” Luptak for their dedicated service to our country!